things i love…secrets. mary’s standby secret? "candy." whenever I ask her to tell me a secret, that’s the one I always get. Today she added, "please" in the next breath. what does Mary love? ravioli for lunch, spilling down the shirt her mommy made for her last week. what else do I love? a jaw line. which appears to be missing from this angle….hmph. so sweet. ken is just getting into secret telling – her fave – “secret mama”. with a big grin. Very sweet photo.Josies secrets are always in a code only she knows the answer too! lovely capture. and dont you just love that tickle in your ear fromthat hot toddler breath? i do. This is a comment for your last post–as the comments weren’t working. Congrats!! That is so excited and I’m glad everything has been going well in the first trimester. The peak at the quilt in the photo below–it looks beautiful! Did you make it? sweeties whispering sweet nothings – could it get any better? 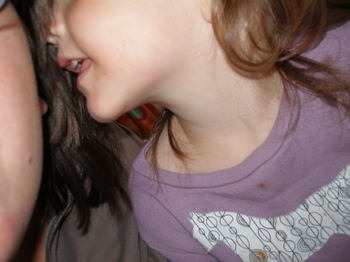 There is nothing better than one of my kids whispering in my ear…nothing.